Klip Gallery: UserVoice – How can we help you today? UserVoice is a software-as-a-service provider of a customer support ticket system, feedback forum and knowledge base. See which Klips are available for this service in the Gallery. Find out how to connect your data when adding a Klip from the Gallery. Track your hourly incoming and outgoing ticket messages. Monitor the monthly response times to your ticket messages. Monitor the hourly response times to your ticket messages. 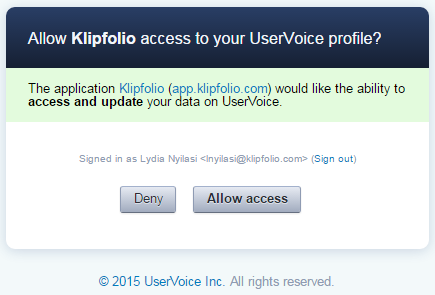 Before adding a UserVoice Klip to your dashboard, navigate to UserVoice and sign in to your UserVoice account. Keep your UserVoice account open in another tab. Navigate back to Klipfolio and select a UserVoice Klip from the Gallery. On the Connect to services popup, use the drop-down menu to Select a token or Create a new OAuth token. 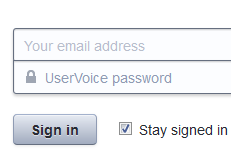 In the UserVoice authentication popup window, select Allow Access. To learn more about Oauth tokens, see Managing OAuth Tokens. You now have a UserVoice OAuth token. Navigate back to your UserVoice account. Notice the URL in the address bar. Copy your subdomain name from the URL and paste it into Klipfolio.